Vancouver’s Eco Fashion Week just wrapped up for another season, and eco-fashionistas are already looking forward to next season’s event in October. The event has grown in leaps and bounds since its inception in 2009, bringing to life the brilliant vision of president and founder Myriam Laroche. When she took the podium to address the media, Laroche’s passion shone. She explained how we need to challenge the status quo and show the world that high fashion can also be sustainable. Joining her at the podium was Anny LeClerc, Director of Value Village, the world’s largest recycler of used clothing. This year saw Eco-Fashion Week partner with the international thrift store chain for the first time. LeClerc explained how her company saves 600 million pounds of clothes from ending up in the landfill each year. “An easy way to go fashionably green is to shop thrift,” she noted. Indeed! Laroche’s outfit, which easily could have come from Holt Renfrew or any other high fashion designer boutique in the city, was actually head-to-toe Value Village! As she posed playfully for the press, she showed off a gorgeous black dress ($29!) she had fashionably knotted in the back to give it a modern edge, funky black lace fishnet tights (.99! ), and the icing on the cake, Stuart Weitzman pumps, purchased for a tenth of the price of new shoes. Vancouver’s pledge to be the greenest city in the world is well on its fashionable way indeed. 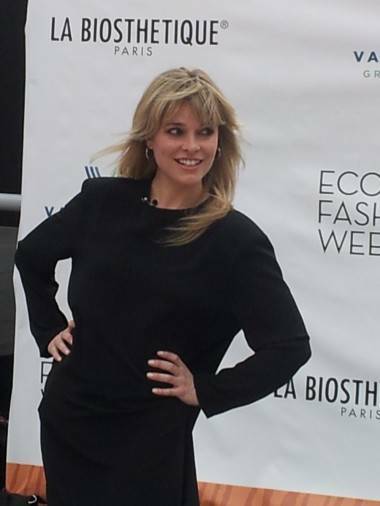 This entry was posted in events and tagged Eco-Fashion Week, fashion, Myriam Laroche, Vancouver. Bookmark the permalink.